Thinking about ways to engage your children in gardening and educational opportunities outside of the classroom? Creating your very own veggie patch with them is a great way to help them develop interest in the wonderful hobby of gardening! Growing a vegetable garden links together many concepts your children are learning about in school while teaching them the art of discipline, responsibility and delayed gratification. Here are some great tips on how to nurture this project with your children. The joy of being able to eat the fruits of their labors straight out of the garden will be an amazing reward for children. Vegetables like snap peas and cherry tomatoes are great for this. A bonus is that pea seeds are big and easy for those tiny hands to plant if you are going to have your children involved in the garden from the very beginning. Another great route when choosing what to plant is picking vegetables that children have a strong connection to. Pumpkins are a great example of this. Children will love to grow pumpkins because of the promise of carving a jack-o-lantern later in the year. One thing you don’t think about until you have kids is how to streamline your garden activities in a way that accommodates them. Convenience is critical when trying to manage children and do gardening at the same time. Go easy on yourself by placing your garden as close to a water source as possible. It is always nice to give children a bit of excitement right off the start. Lettuce is always good for this. It grows fairly quickly and will grab the interest of your children while they wait for the other plants to sprout. Involving your kids in the planting is definitely a lot of work, but it really helps build their interest and education later on. Get them to hoe rows, dig holes, or water as you plant. This will help them connect all the processes together in their minds, and will keep the engaged later on. 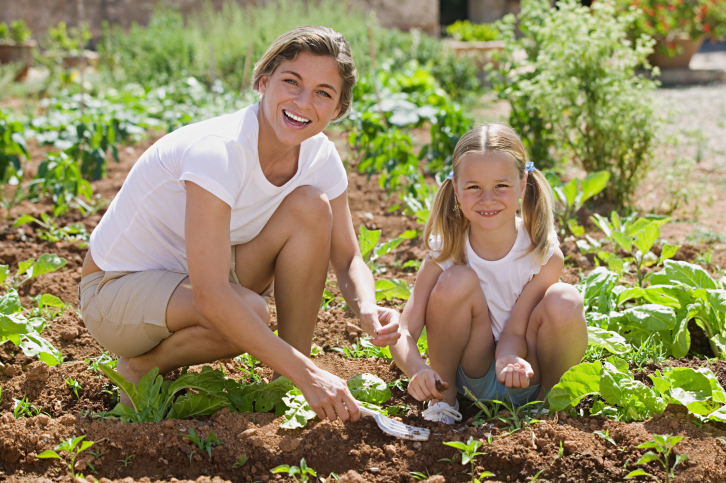 Make the garden an ongoing, continuous project that the children are involved in. Don’t let weeks go by before you bring the kids out to it again – they might get bored or develop other interests. Always look for opportunities to involve them in the work. One of the easiest ways to get children excited about what is growing in the garden is to make it come alive with color. There are many different ways you can bring a splash of color to the garden. Choose a variety of lettuce, radishes, or squash to bring interesting and unique shapes, sizes and color to the garden! Building a garden is a fun way to teach your children the value of hard work and perseverance, and to help them learn science! A garden can engage children and draw you all closer together as you work toward a common goal. If you have questions as to whether a garden will increase the value of your property, call your trusted mortgage professional today for more information. This entry was posted in From Michelle to You and tagged Around The Home, Homeowner Tips, Vegetable Garden by BJ Kirkpatrick. Bookmark the permalink.